Thanksgiving 2012 was… eventful. At my house, anyway. The events that went down are twofold: first, my sister got engaged. ENGAGED! To John! There was a proposal on a bench and a diamond and everything. There were hugs and elation and glasses of champagne! Everything was happy and goodness. And then everybody threw up. I’m not even kidding a little bit. The joyful holiday weekend quickly turned into Stomach-Bugsgiving, 2012. It started with one person (I don’t want to blame Ben, but it was probably his fault), and quickly moved to two, then three and four and five and on to ten. Ten people! Downed by horrible, feverish plague (or, more likely, Norovirus). It even got Grandma. We all tried to fight it, but before we knew it we were dropping like flies, and instead of feasting on stuffing and pie and potatoes we were cautiously nibbling saltines and sipping Gatorade with Tylenol. It was the only Thanksgiving in the history of Thanksgivings where everyone actually lost weight. Still, we’re a tough crowd. 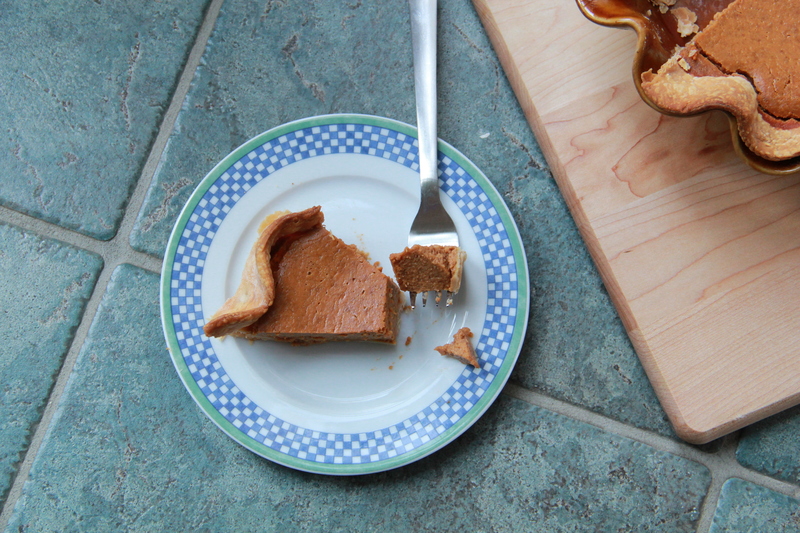 We soldiered on, we set the table, we had some seltzer water and some laughs and even a little pie. Come on, Norovirus. We are Gilberts. You can’t keep us from the pie. I’m calling this pie “traditional”for two reasons. One is that my family has been eating it at Thanksgiving for as long as I can remember (through wind and rain and Norovirus). 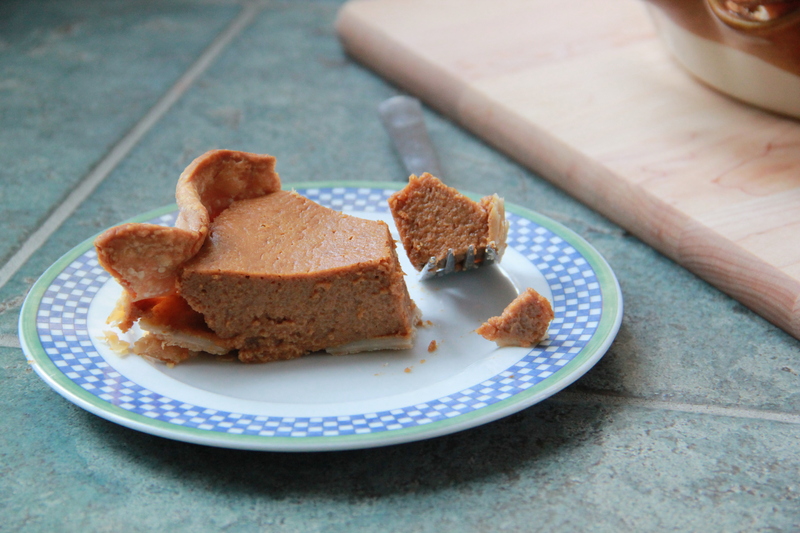 The other is that the recipe comes from the back of the Libby’s Pumpkin can — we adjust the spices for a more flavorful pie, but it’s pretty much the same recipe that’s been on that can since 1950. Traditional! To make pie dough from scratch, dump the flour, salt and sugar in the bowl of a food processor fitted with the steel blade. Pulse for about 5 seconds to combine. Add the cubed butter and pulse about 10 times, until the butter has been processed into bits the size of small peas. With the motor running, pour the ice water down the feed tube and continue to pulse until the dough starts to come together. Transfer the dough to a floured surface and gather it into a flat disc (it will be a bit wet and sticky – flouring your hands will make it easier to shape). Wrap it tightly in plastic wrap and chill for at least 1 hour in the refrigerator (or about 30 minutes in the freezer). Once the dough has rested and chilled, remove the it from the plastic wrap and set it on a well-floured work surface. Use ample flour and a rolling pin to roll the dough into a large circle, about 1/4-inch thick. Carefully transfer the rolled dough to a 9-inch pie dish, handling the soft dough gently and crimping the edges to your liking. Place the crust-filled pie dish in the refrigerator or freezer to allow the dough to re-firm while you mix up the filling. To make pumpkin filling, first whisk together the sugar, cinnamon, salt, ginger, cloves and nutmeg in a small bowl. In a larger bowl, whisk together the pumpkin and eggs until smooth. Add the sugar/spice mixture to the pumpkin, and whisk to combine. Whisk in the evaporated milk. 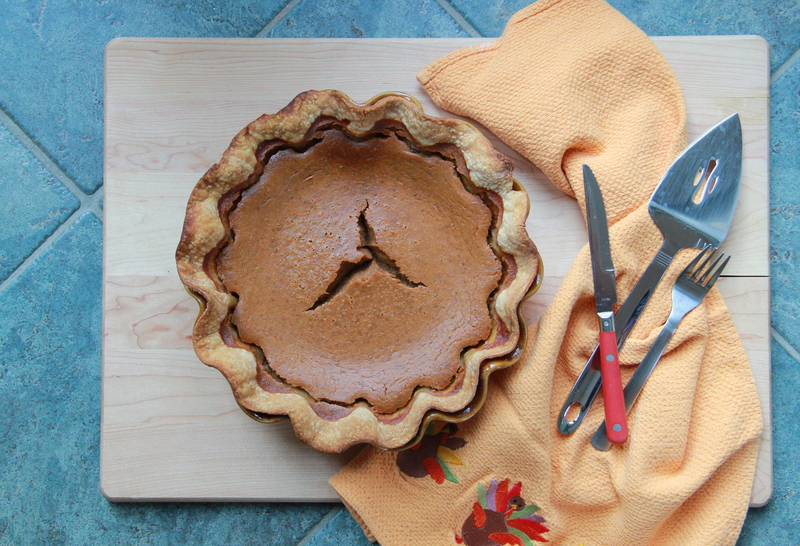 Pour the pumpkin filling into the unbaked and chilled pie crust, and bake the pie at 425 degrees for 15 minutes, then lower the heat to 350 degrees and bake for an additional 40-45 minutes, until filling jiggles only slightly and a knife inserted into the center of the pie comes out clean. 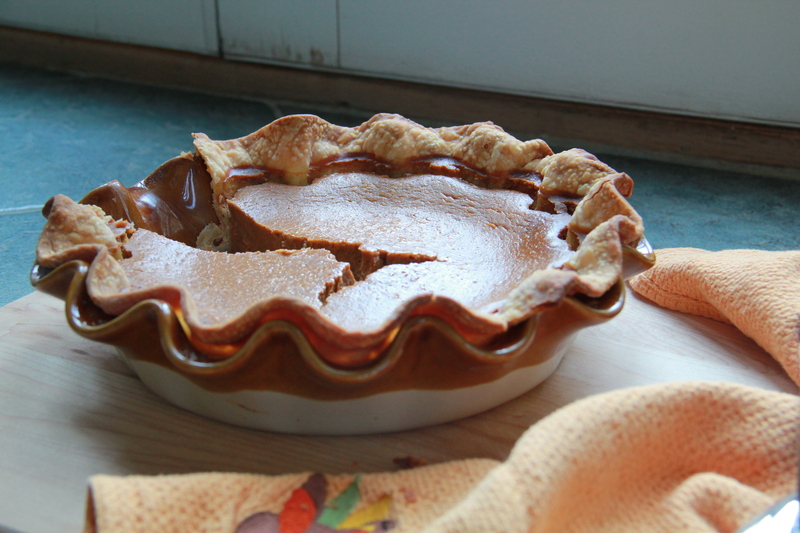 Allow pumpkin pie to cool completely before enjoying cold or at room temperature, with a thick scoop of whipped cream. I don’t mean to laugh but… I think you wanted us to. 😉 That is a very eventful Thanksgiving! All that happened at my parents’ house is that we started the turkey too late, it took too long, and we never ended up eating it. So, we (I?) drank a lot of wine. Hope you’re feeling better by now! We need you to post more pies and cookies. heard how horrible it was — EXCEPT for the fact that Emily got engaged!!!! How awesome!!! love and miss you, chef molly! Uhm, I’m ready for the leftovers now. Where’d they all go?! The Plague notwithstanding, it was a most marvelous Thanksgiving!! We’ll be telling the story of the 2012 Thanksgiving for many years: the highs were so high (Emily & John!) and the lows were about toilet level!! Love you so, Molls, and miss you already. A holiday to remember! and since so many fell prey to the bug, there was more pie for the rest of us! bwahahahahaha….